A total of 269 people attended the two Open House meetings the Georgia Department of Transportation held in the last two weeks on the widening of U.S. 441 and the bypass of Bishop, including 195 at the Open House last week at Oconee Veterans Park. Attendees at both sessions got a chance to view maps showing the widening plans for the highway from the bypass in Madison to just south of Bishop and from just north of Bishop to the Watkinsville bypass and the truck bypass on the eastern side of Bishop. No formal presentation was made, but attendees were given a chance to talk with representatives of GDOT and its consultants and to fill out a comment sheet asking them if they supported the project. Greg McGarity, director of Athletics at the University of Georgia, last week restated his opposition to the proposed bypass of Bishop, which will border the university’s Equestrian Facility on Astondale Road. The Oconee County Board of Commissioners tomorrow (Tuesday) night will take up another road project that has created challenges in the past because of its potential impact on wetlands that form the headwaters of Calls Creek, just outside Watkinsville. The Board is being asked to approve an Intergovernmental Agreement with the University of North Georgia through which the county would agree to extend Bishop Farms Parkway from its current terminus at the university campus to New High Shoals Road. The University would contributed $200,000 to the unspecified costs of the project. The first Open House on the U.S. 441 widening took place from 5 to 7 p.m. on March 12 at the Morgan County High School Cafeteria in Madison. Bruce Anderson, project manager with GDOT, told me in an email message last week that 74 persons attended. The second Open House was from 5 to 7 p.m. on March 19 at Oconee Veterans Park. A total of 195 people in addition to GDOT and its consultants attended that session. The room was crowded from the moment the doors opened to the large meeting room. Attendees received a four-page handout, with the last page being a comment sheet. A table contained a box where those comment sheets could be deposited. Easels around the room displayed a series of maps showing the plans for the highway improvements from Madison to Watkinsville. The project is broken into three parts. The first is 8.5 miles in Morgan County from the Madison Bypass to the Apalachee River. The second component begins at the Apalachee River, continues to Astondale Road at the south of Bishop, and then runs from SR 186 north of Bishop to the Watkinsville Bypass. Total length of this component is 8.2 miles. For these two components, GDOT would build a four-lane road with a median that would follow the existing alignment of U.S. 441. In Morgan County, the roadway would have a 32-foot depressed grass median, according to the information released by GDOT at the meeting. In Oconee County, the roadway would have a 24-foot raised median. Alignment will shift from one side of the existing road to the other to minimize impact, according to the handout. Existing right of way for these sections of roadway is approximately 130 feet, according to the handout. The state will need additional right of way and easements, the handout said, but the amount is not known at this time. The third component of the plans presented at the Open House is a truck bypass of Bishop that would begin at the intersection of U.S. 441 and Astondale Road and run east of Bishop to the intersection of U.S. 441 and SR 186 (High Shoals Road). The 0.8 mile bypass would be two-lanes wide and be designated for truck use. The handout states that minor improvements to the two-lane road through Bishop also are anticipated. The maps released at the hearing show roundabouts at the intersections of the bypass with the existing U.S. 441. The truck bypass would follow and replace the existing Astondale Road for a short distance and then turn to create the bypass loop. At that point, the truck bypass would cross property owned by the University System of Georgia and housing the University of Georgia Equestrian Facility. The maps show a new intersection of Astondale Road with the bypass and berms between the roadway and a part of the University System property. McGarity’s sent a letter dated March 18 to to GDOT Commissioner Russell McMurry and Jamie Boswell, Congressional District 10 representative to the Georgia Transportation Board, objecting to the current plans for the bypass. McGarity sent two earlier letters to Boswell making essentially the same argument. McGarity said the university “is asking GDOT to make all possible effort to mitigate noise emanating from the two proposed roundabouts and the entire proposed road in between the end points, should the Department choose to proceed with the bypass,” McGarity wrote. J. Griffin Doyle, vice president for Government Relations at the University of Georgia, provided me the copy of McGarity’s letter. GDOT is accepting comments on the project until April 2 through an online version of the form distributed at the Open House meetings. The survey is the fourth tab of a green box on the screen. The prior tabs show project details. The third tab shows project impacts. By dragging the Property icon to the map below it and, by zooming, it is possible to see details of the bypass’ impact on property owners. The GDOT handout said that "After hearing from the public, GDOT will make any necessary adjustments to the preliminary designs." Construction on the project is expected to occur no sooner than 2021, the handout said. Oconee County Administrator Justin Kirouac will bring the proposed Intergovernmental Agreement with the University of North Georgia before the Oconee County Board of Commissioners tomorrow night for action. The county would agree to construct the extension at its expense, with the University of North Georgia contributing $200,000 if construction begins by June 30, 2020. 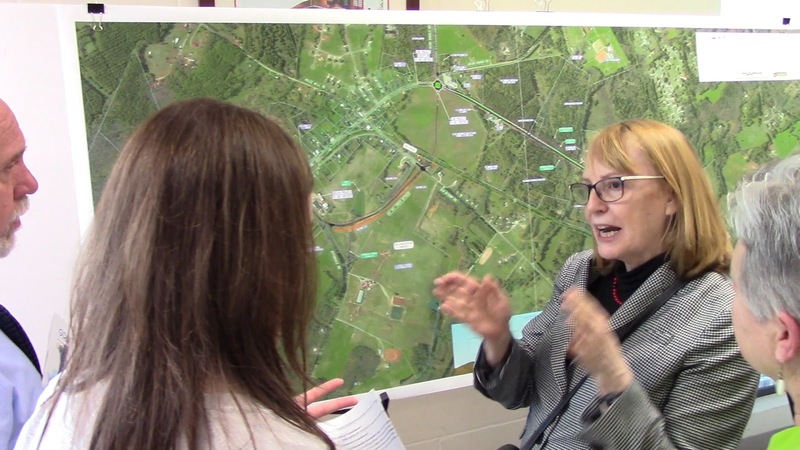 Extension of Bishop Farms Parkway has been a frequent topic of discussion in the county to accommodate the growth of the Oconee County Campus of the University of North Georgia, but obstacles, including the existence of wetlands, have been roadblocks to date. The main branch of Calls Creek forms in those wetlands before flowing into Watkinsville and through Harris Shoals Park. The agenda for the meeting of the Board of Commissioners also includes action on construction of an addition to the county’s Animal Shelter, discussion of plans for creation of a County Visitors Bureau, and a bid of $2.4 million for construction of the sally port and three-story addition to the Courthouse. The meeting starts at 6 p.m. at the Courthouse in Watkinsville. I was not able to attend either of the GDOT Open House meetings because I was out of town. Tony Glenn did attend the meeting on March 19 at Oconee Veterans Park and recorded a series of video clips. I edited them into the short video below to give a sense of the Open House. GDOT officials keep an official count of those who enter the room. GDOT needs to build a bypass around Bishop just the the one around Watkinsville and Eatonton. If they don't do it now, it will be done eventually, but only after much aggravation, accidents, and money wasted.